Ink-a-Doodle Creations: Joyful Christmas Treats!! Good morning bloggers! Wait a minute is it still morning? Yep, I have 8 more minutes, LOL! I wanted to share the cute little candy boxes I made for everyone who came to my house this year on Christmas day. 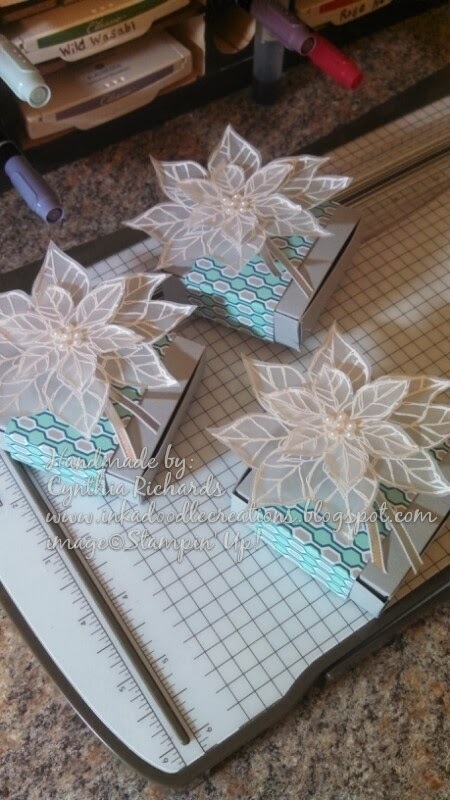 I used the Joyful Christmas stamp set to stamp and heat with white embossing power on top of vellum paper, and used the Winter Frost DSP to make a belly band to go around the box. I love how they turned out. I'm so glad that this stamp set carried over and will still be available for a while! Each box held perfectly two milk chocolate and caramel Ghirardelli squares! !